Blog posts with a category of Self Injury. 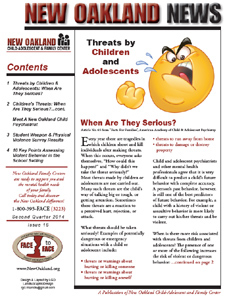 Threats by Children & Adolescents: When Are They Serious? Children’s Threats: When Are They Serious? The death of the fabulously talented and accomplished actor, Philip Seymour Hoffman from a heroin overdose, sent shock waves through the entertainment world and once again elicited a slew of ill-informed and malicious responses. The gist was that addicts are weak. The uninformed think that people can “kick the habit,” but in truth, they can’t. At New Oakland, we are well aware that addiction is a form of mental illness, and one of our specialties is addiction counseling. Addiction changes the brain, disturbing a person’s normal hierarchy of needs and desires and substituting new priorities connected with procuring and using the drug. The result is an inability to control impulses, and that makes addiction similar to other mental illnesses. Chilling fact: More people will die of opiate addiction in the next 30 days than died in the 9/11 tragedy. Philip Seymour Hoffman is just the most famous. Kids have been bullying each other for generations. What makes it different now is the long-standing nature, the permanent nature of statements on line. If it takes a village to raise a child, it’s now taking a national awareness movement to prevent our children from causing devastating emotional wounds and provoking suicidal thoughts and actions on their equally young and fragile peers. Social media has vastly intensified the ability to inflict relentless pressure and pain, and America has been jolted again by the suicide of 12-year-old Rebecca Ann Sedwick of of Lakeland, Florida, who leaped to her death from a cement factory silo. It was then that the Polk County Sheriff arrested the 14-year-old on charges of aggravated stalking, a 3rd degree felony. The viral effect of social media allowed her tormentor to recruit as many as 15 girls who picked on Rebecca for months through online message boards and texts. She had no effective defense, no hiding and no escape. Even her mother’s awareness and vigilance couldn’t shield her daughter from a prolonged and ultimately deadly attack.